It was nearly five years ago that I went away on a two weeks trip to Nigeria working for a well known Confectionery factory in Lagos. This was suppose to be my prize! I had alot of fun, working along side a very senior and experience colleague who I share a great experience and have learnt alot from him. There were many funny and interesting stories that I still have strong memory of. Five years on, I am still here but much of my colleagues have changed. We are at a different phase. On Monday I will be setting off again for the same well known confectionery company but this time their two sites in Russia. Now I am five years older (slightly wiser amd just a little thinner) but I am more established, able to standup with my own two feet. I am more confident in what I know and what I do. I am no longer learning. I am going out there to do a job, a job that I know well. But like any opportunities or experience come before me, I always have huge expectation of what I want to get out of it. And yet to be honest I have not found that yet with this trip. Not saying I am looking forward to it, but that penny has dropped yet. It will when the first drop of Vodka goes it. It will be cold there, so drinking for the sake of keeping warm! I am very curious and as such will be fascinated by the different culture. I also have the Chinese spirits – We are everywhere! We live anywhere! and we will find our place anywhere in the world! Just like last time in Nigeria, I open the curtains for the first time in my hotel room. My room overlook a shop and a Chinese Restaurant with a big neon light sign. I was shock to be honest, to come all this way and find a Chinese restaurant! Well the second week I will be staying in the site camp the so called Portacabin, so definitely not going to see a Chinese Restaurant! I am sure I will discover Russia like I discover Nigeria and have a wonderful time. It is one good side of my job that lets me explore the world and thank you to the well known confectionery company. Hope I will be able to blog while in Russia and post some photos too. Moving house is always a pain in the backside for me as I am a rubbish collector. I mean electrical/computer gadgets etc etc. I am also lucky that my new place is big enough to accommodate everything including all 6 of my computers. (Lomug, Lomug the 2nd, Superman, Littleson, Catbus, Sofastreet (the WHS) ). They are all named after my childhood toys, will need a whole blog post to explain. Moved in at the end of Feb, after coming back from my annual trip to Hong Kong for the Chinese New Year. My parent came to stay with me for a total 5 months this year in two different stints. It was good that the whole family was all under one roof. My parent felt healthier with the cleaner English air compared to the dirty air in Hong Kong. The new place also suited my brother who was working in town. It would only take him a short walk to city centre. Workwise, it was pretty much the same, always busy, dull at times, hectic, chaotic, a lot of reports and my special spreadsheets. I wonder someday if I would be near good enough to setup an excel consultancy… maybe not just yet. And of course, I help my clients to save a lot of Carbon Emissions. Highlight is always winning more projects from existing clients. I like follow-on work because that is how I value my hard work. My brother decided that he would move back to Hong Kong for good. So he did in Oct with an internal transfer to his company’s HK office. But after the first week, he wanted to do a u-turn, only for the UK office to say they can’t take him back. Working is HK is not like UK, it is very tough, 8to8 mostly 6 days a week. A lot of pressure, back stabbing, office politics etc. My brother being the spoiled one in the family of course reacted to it negatively. It is highly likely that he will be back in the UK, probably after a year away. May be after all these years in UK, it is difficult to change. (me too! I think) Even my parent want him to come back to UK, they rather fly over and stay with us then see him work to dead. Finally, let look forward to the New Year. My wish is that I use 2010 to fix all my problems. I definitely need to find a new spark in my work and personal life before running out of batteries. As always I wish to help a lot of people. This is the reason I get up every morning, but only this year, I have to find someone to help me. Keep educate people Apple is evil. iWhatever will be withdrawn worldwide. My dream will be complete. This post is dedicated to my good friend who just got fired because he writes a blog which has some very very small related stuff about work. The real reason is that his company is cutting cost and have targeted him. There is no doubt about it, this will get messy. The claim is very dodgy, his blog is much less revealing than mine. When I saw his tweet, I said to him, I am so fired too. But come on, there wasn’t anything confidential whatsoever, it is the most tiny of evidence that the company has used. Shame on them! Everyone is obviously supporting him and I should expect the full tribunal thing coming up. But still at the end of the day, the job is gone, may be just little bit more compensation. So I thought will I get fired, might be I just need to check all my blog entries now to see if I have offended anyone. But I know that I would have the decency to say it to their faces too. At the same time, I should also read my contract, to see if writing a blog relating to work break any rules. In the modern world of facebooking, blogging, tweeting. It is so easy. I think we have to sensible here, if there is commercial sensitive material leak then yes. But there are many grey areas. I love what I do, I have no intention of giving up what I do. I love all my colleagues, they are all great. Everyone is a superconsultant. I AM NOT JOKING, but the first result is really it… unbelievable!!! This should do to show my true appreciation of my employer, so please don’t sack me…..
How “Old School” are they? How old is traditional? How traditional is old? The definition of “old school” would be different comparing someone in their 20s than someone in their 30s. The term old school is relative. I think the “old school” barrier is at age 30. You can’t be called “old school” until you have passed that. “old school” is a phase that relate to whoever say it. “oh these new starters are all new school!” Doesn’t really sound right. So next time, you use the phase, make sure you count the number of “old” first. BTW, I am “intermediate school” not yet “old school”….. I bought a new Microwave over the weekend. It is a Panasonic NNA554W. It cost me £150. It is a combination one, microwave, grill and oven. Shopping at Argos is a pain for these item, the description never tell you everything. You have the buy it, open it and to see whether it is what you are after. So I went to Currys and Comet. What Currys has got, Comet don’t what Comet has got Currys don’t. So can’t really compare. But at least you can slam as many doors, press the door open button as many time, you can still walk out the store without purchasing one. Finally set my eye on this Panasonic, white but stainless steel inside (must have for me), the brand is good too. Then today, just check the COMET WEBSITE, it is on for £16 less, you can collect from store. It is very difficult to shop from both side. Being a techno nerd, I am disappointed I didn’t check online with my windows mobile. A little £16 of a lesson is a good price to pay. Let have a cup of tea and have a discussion about what we are going to do. I admire the British for developing structures and systems. But when it come to action, they are always slow to react. Where is the decision maker, where is the ruthlessness. In some case, just be more direct, rather than passive. If I believe in a clever dictator system, is foolish bureaucracy the opposite and what we have here. Swine flu is yet another example, if people have flu, even just the normal flu, rest, take some paracetamol and DON’T come to work to spread the virus. Isolate. it is very simple no no, we let it spread, because we can’t control it. Let talk about alert level and setup a system for the benefit of the public. Might be my clever dictatorship is far too extreme but how about a smart expect. I like a smart doctor to give me advice not a useless help-desk person reading off the screen. Just get some actions in place. No more discussion, no more useless meeting, no more brainless non-functional help-desk. A great speech of Cricket. If you are a cricket fan, the 1st test in the 2009 Ashes Series is definitely not boring. It was probably boring for the couple of days that the Aussie was batting. But overall it is not. England got a good-ish score of 430 odd. But not good enough on that pitch, the Aussie got 670 odd. 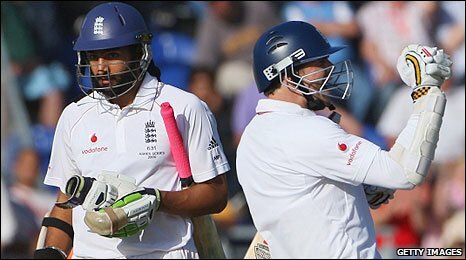 England had about 4 session to bat through and avoid a defeat. Definitely not easy at all. England really has no chance of winning but saving a test match means alot. To the fan who was cheering like mad, it was more like a victory. In the end, England just just made the draw, by one wicket. It could have easily been a innings defeat. Only can this happen in Cricket. Next test is at Lord’s, even more pressure this time. Prof. (Emer.) Reg Mann (passed away on Sunday, June 7, 2009) aged in his early 60s after a stroke. He was my lecturer for “Chemical Reaction Engineering” at UMIST. He was very well prepared but not a very good teacher. He is more fond of his research and company. He once said to us student, he will charge us £125 per hour for asking him questions, same as what he gets from consultancy service. Currently I am only a £85 per hour consultant and no where near his level. (if that was true). Of course it is not really a benefit to the students but I really admire the use of technology back then. I am by all means breaking my rules for starting to Twitter. I regard Facebook and other social networking sites are evil. So why I have change my mind about Twitter. Don’t get me wrong, there are certain aspects in Twitter that is similar to Facebook. Even if I block people from following me on Twitter. They can still see who I follow, my interest etc. The main reason is, Twitter is for grown ups! This is the main advantage. There is no boundary for words either. You can chat to pretty much everyone (given they are on Twitter). Twitting is email 2.0 with an open directory of the world. However, I will not give up blogging, because I am long-winded. © 2010 Moon - All Rights Reserved.